Toward late October, my friends and I co-hosted a Halloween bash. I was in charge of dessert and, after sifting through zillions of cookie recipes, decided to try these. They were a HUGE hit. I made two batches and they were almost all gone before the end of the night. 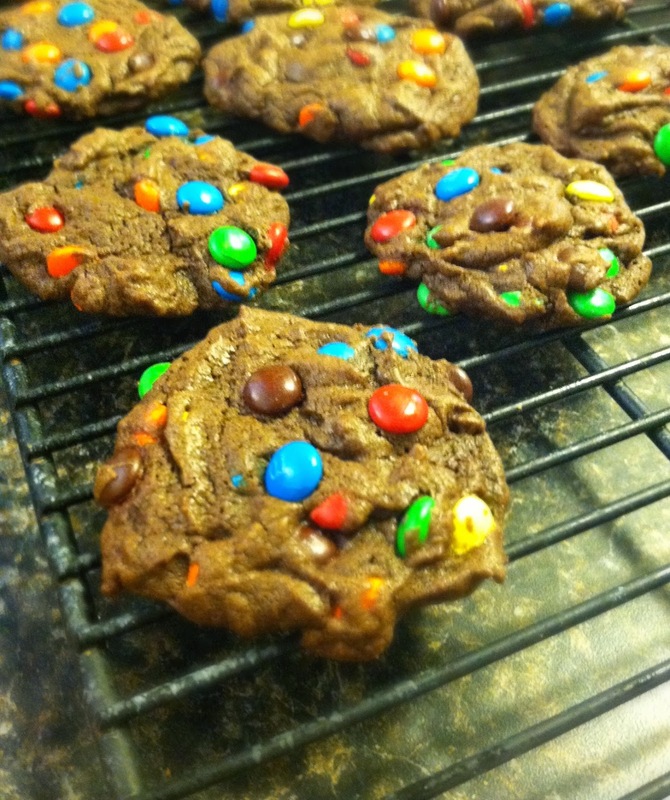 The subtle crunch of the M&M shells contrasted beautifully with the cookie base. Winner, winner! In a medium bowl, whisk the flour, cocoa powder, cornstarch, baking soda, and salt together. In the bowl of a stand mixer fitted with the paddle attachment, cream the butter and both sugars on medium speed until light and fluffy, about 3 minutes. Beat in the egg and then the vanilla. With the mixer on low, gradually add the dry ingredients, beating just until combined. Mix in the mini M&M's. Using a small cookie scoop (mine measures about 1 1/2 inches across), portion the batter onto the prepared baking sheets, spacing the cookies about 2 inches apart. Bake for about 8 minutes (rotating the baking sheets halfway through if you're doing both at once) or until the edges of the cookies are set (the centers may look underdone - don't overbake!). Allow the cookies to cool for a few minutes, then remove them to wire racks to cool completely. Repeat with all of the dough. Oh wow what a delicious recipe, I want to skip to the eating part already haha. Sounds and looks delicious, will definitely try these for myself. Thanks for the recipe, hope to see more soon.